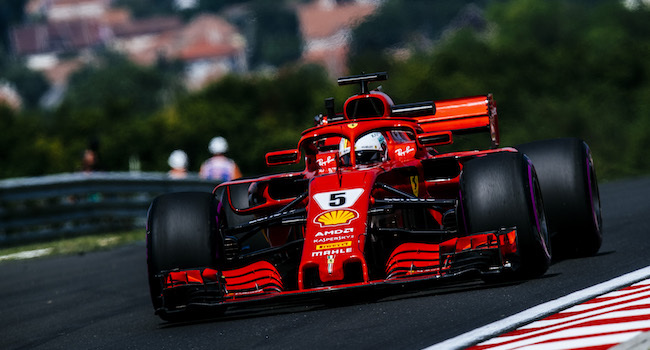 Friday’s F1 track action has come to an end at the Hungaroring with Ferrari's Sebastian Vettel leading FP2 with a mark of 1:16.834, which was .074 of a second better than his nearest pursuer, Red Bull’s Max Verstappen. The Hungaroring track record of 1:16.276, set last year by Vettel in the final round of qualifying, remained intact. “I was pretty happy in the afternoon” Vettel said “more than in the morning session, as I think the car is performing well also over one lap. "We can still improve, but this has been one of the best Fridays so far, technically speaking. Having a great amount of work ahead of us is probably the best thing for keeping our mind busy and getting through the weekend. It’s not easy, but I focused on the job to do. On this track, the qualifying session and the start are very important and can make the difference because overtaking is very difficult. Getting ahead after the first couple of corners is crucial, but there’s a lot of work to do before getting to that point”. Leading the way in FP1 was Red Bull driver Daniel Ricciardo, whose fast lap of 1:17.613 was .079 of a second better than the next quickest driver.